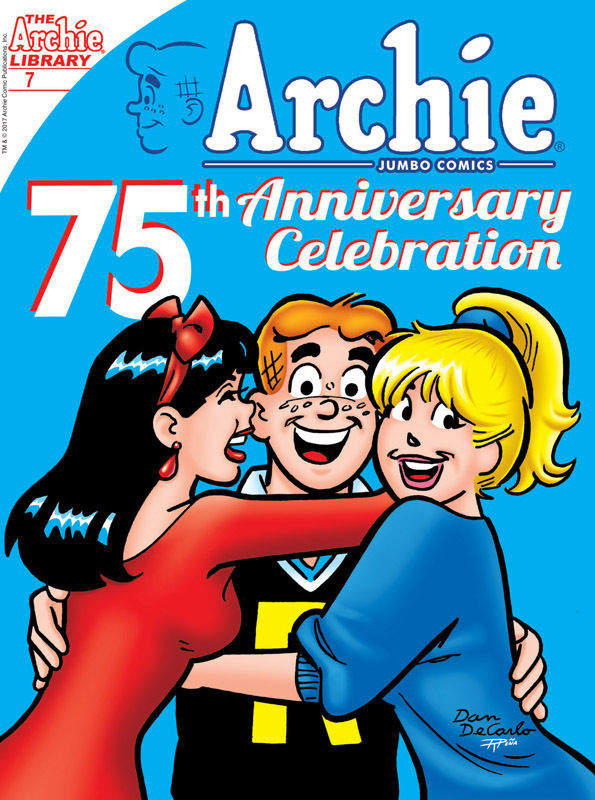 Celebrate Archie's 75th anniversary in a special way with the first installment of this BRAND NEW commemorative digest series! This issue is jam-packed some of the best Archie stories, bonus art pages and fun intros from writers, artists and fans alike. 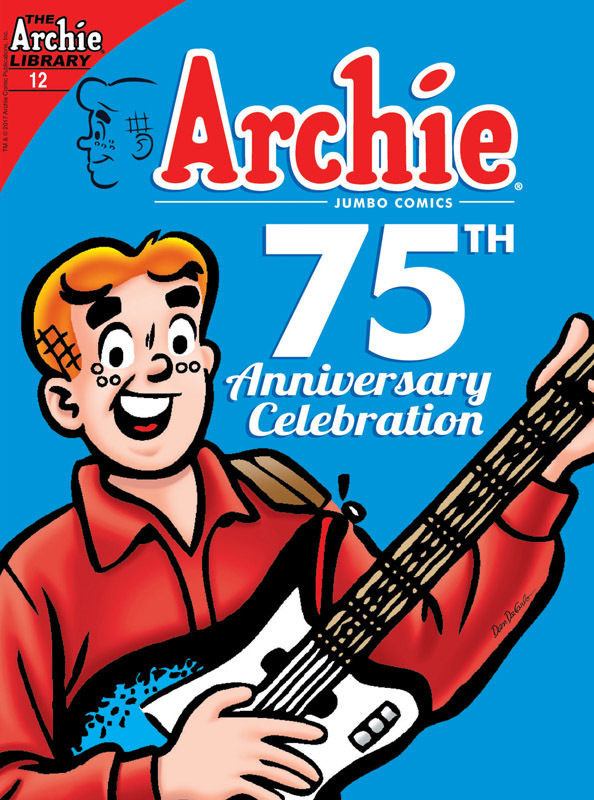 Each anniversary digest is a special collector's item for every Archie fan! Monsters rule the world. 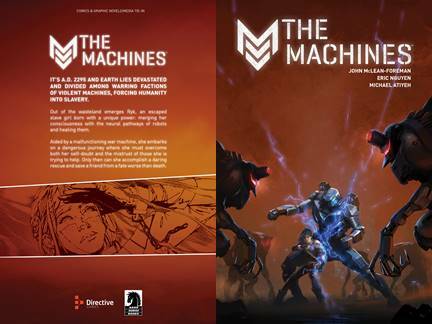 Humanity's last hope is a squad of giant robots and their skilled pilots, all from different backgrounds, each with a unique reason to fight. Can we survive the conflict? Are we worth saving? A familiar but wholly original story about war, survival, and the human spirit, told through gigantic-scale battles fought by memorable characters! 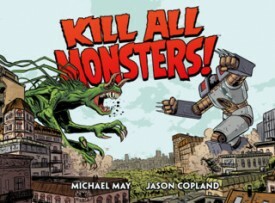 Contains over 100 pages of new story, in addition to collecting the entire hit webcomic! 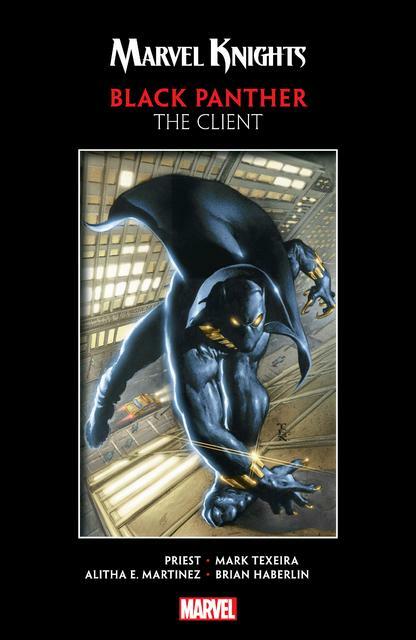 Collects Black Panther (1998) #1-5. King T'Challa of Wakanda is not just a monarch - he is the Black Panther, the nation's ceremonial protector! And he fights an unceasing battle to safeguard his homeland from those who seek to plunder its amazing riches and technology. T'Challa has forged a fearsome reputation as a monarch, a warrior and even an Avenger. But now a very different king hungers for Wakanda - a king of hell itself. And T'Challa, together with his deadly Dora Milaje, must battle to protect his people's very souls! The Panther travels to America to fight his diplomatic and spiritual war on many fronts - and State Department Special Attaché Everett K. Ross, assigned to the visiting king, swiftly becomes a man far out of his depth. Priest kicks off a revolutionary era of Black Panther! The Teen Titans are settling into their new lives in Titans Tower in San Francisco...even if answering to Damian Wayne takes a lot of getting used to. But Beast Boy, Raven, Starfire and Kid Flash soon have a lot more than an overbearing Robin to worry about - a prison breakout has led to a string of disappearances, and some of them hit close to home. Now, to rescue the kidnapped, the Titans will have to go toe-to-fin with King Shark, and the Titans are out of their depth...literally! But a new teen hero named Jackson Hyde has seen the Titans in action, and he's headed to Titans Tower to try to join the team. Will Aqualad be enough to turn the tide for the Teen Titans...or will the mystery of his powers unleash an even deadlier threat to the team? Writer Benjamin Percy (Green Arrow) and artist Khoi Pham (X-Force) continue the adventures of the heroes of tomorrow, today! Exploding from the blockbuster DC Rebirth event, it's an action-packed new spin on one of the most famous superhero teams of all time, from writer Benjamin Percy (GREEN ARROW) and a titanic team of talented artists including Jonboy Meyers (Spawn), Diogenes Neves (GREEN LANTERN: NEW GUARDIANS) and Khoi Pham (The Mighty Avengers) comes TEEN TITANS VOL. 1: DAMIAN KNOWS BEST. His father is the world's greatest detective. His grandfather is the world's deadliest terrorist. He is Damian Wayne, a.k.a. 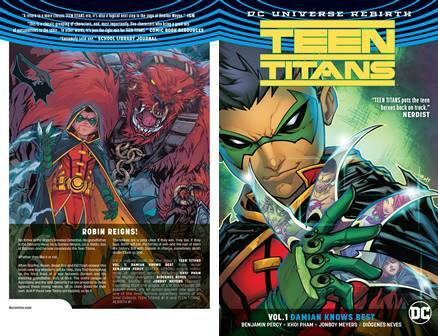 Robin, Son of Batman-and he now commands the Teen Titans. When Starfire, Raven, Beast Boy and Kid Flash answer this brash new Boy Wonder's call for help, they find themselves on the front lines of a war between Damian and his immortal grandfather, Ra's al Ghul. The entire League of Assassins and the elite Demon's Fist are prepared to move against these young heroes, all to claim Robin for their own. And if these new Titans are toppled, so be it. 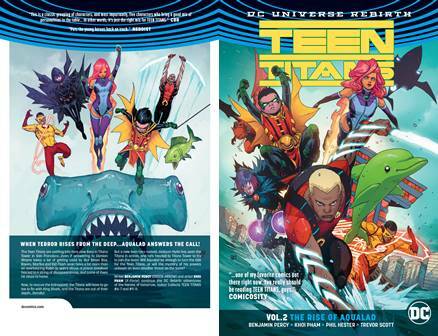 It's a culture clash for the ages in TEEN TITANS VOL. 1: DAMIAN KNOWS BEST. Collects TEEN TITANS (2016-) #1-5 and TEEN TITANS: REBIRTH #1. The Eisner-award winning bumbling barbarian returns for a hilarious adventure full of mistakes, misunderstandings, and cheese dip. We had the Fray of the Gods. Now we have the Play of the Gods--a tale of lust for gold, lust for power, and lust for cheese dip. 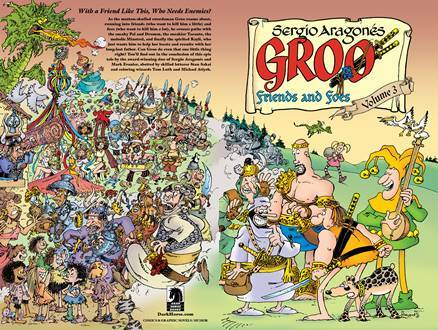 As with all things Groo, it's brought to you by the award-winning team of Sergio Aragonés, ably assisted by the lettering of Stan Sakai and the coloring of Tom Luth. The Gods themselves watch this story from the above so it must be good enough for you. This handsome paperback volume collects all four issues of the series: in one package, you get a lot of Groo doing real stupid things and causing mass destruction. Just what you wanted! The mutton-skulled swordsman Groo runs into friends (who want to kill him a little) and foes (who want to kill him a lot). He'll meet up with the sneaky Pal and Drumm, the sneakier Taranto, and the melodic Minstrel . . . but can he help Kayli reunite with her long-lost father? Collects issues #9 - #12 of the year long series from Sergio Aragonés, Mark Evanier, and Tom Luth. As the lunkheaded barbarian Groo continues his wandering journey, he stumbles across - and into - the wise Sage, the beautiful swordswoman Chakaal, Weaver and Scribe, and his own sister Grooella! The award-getting team of Sergio Aragonés and Mark Evanier deliver heaps of their patented silliness! Collects issues #5 - #8 of the greatest Groo series of 2015. As the bird-brained wanderer Groo and his loyal mutt Rufferto crisscross the countryside, they encounter various acquaintances from years past--the hapless seaman Captain Ahax; the sinister witches Arba and Dakarba; the pompous Arcadio the Hero; and Groo's own sweet Granny Groo, who raised from a tot and would never try to profit from him! What will ensue from all these chance meetings? 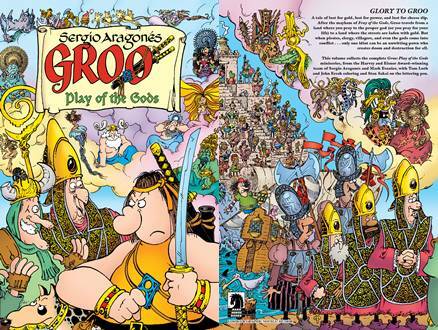 With Groo, the only possible result is chaos! The award-winning team of Sergio Aragonés and Mark Evanier are joined by Tom Luth on colors and Stan Sakai on letters! This volume collects issues #1 - #4 of the Dark Horse Friends and Foes series. 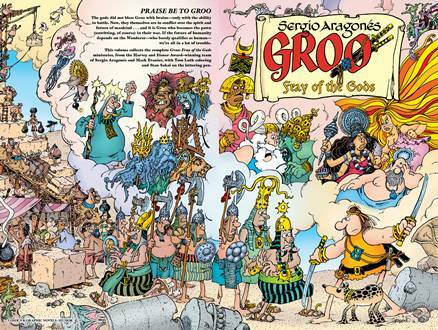 The gods did not bless Groo with brains, only with the ability to battle. Now, they themselves are in conflict over the spirit and future of mankind . . . and it is Groo who becomes the pawn (unwitting, of course) in their war. If the future of humanity depends on the Wanderer, we're all in a lot of trouble. Collects the four-issue miniseries. Brazen robots! Hostile corporate takeovers! Ill-fated interns! Criminally insane turnips! Distinctly unhelpful helper monkeys! And hats, dear God, hats aplenty! All this and more awaits any brave soul ready and willing to enlist in the ranks of the Mighty Skullboy Army! How do you sign up, you ask? 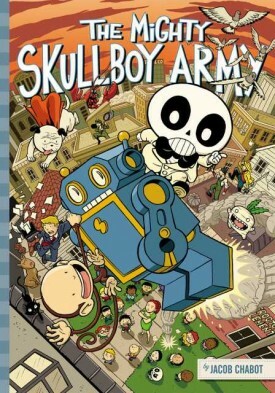 Just purchase this book, absorb its nefarious bounty (we recommend using the eyes-to-brain method), and say hello to your new lord and master, Skullboy! If he's not home from elementary school yet, be sure to pick up a handy pager. You will be called upon when needed. Oh, and be sure to beef up on that health insurance. 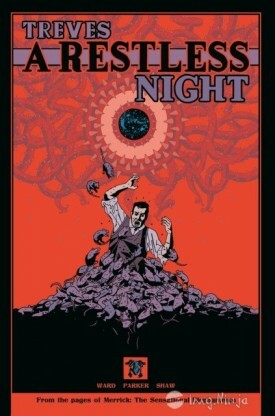 Set before the events in MERRICK: THE SENSATIONAL ELEPHANTMAN, A RESTLESS NIGHT is loosely based upon a true story taken from Treves' journals of his experience travelling through India. It recounts his first encounter with the unexplainable as he fights for his life against a vengeful curse. They are the greatest young heroes this world - or any world - has ever known. They are the Titans. And now, from the void between the worlds, one of their most legendary members has emerged. Wally West, a.k.a. Kid Flash, has returned. Powered by the Speed Force, he's brought the secrets of time and space following in his wake. And with those secrets comes a prize that Deathstroke, the most lethal foe the Titans have ever faced, would do anything to claim: the rebirth of his long-dead son. Now Titans from every team - past, present or future - must unite to stop the killer called Slade from claiming his sinister prize. Can the Titans and the Teen Titans work together to stop this evil? 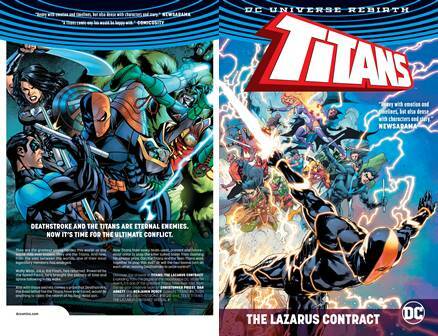 Or will the two teams turn on each other, leaving Deathstroke to seize control? Discover the answer in TITANS: THE LAZARUS CONTRACT! One of the greatest Titans tales ever told, from the creative team of Christopher Priest, Dan Abnett and Benjamin Percy! Collects TITANS (2016-) #11, TEEN TITANS #8, DEATHSTROKE #19-20 and TEEN TITANS ANNUAL #1. Adapted from the upcoming combat strategy game. It's 2295 A.D. and Earth lies devastated and divided among warring factions of violent machines, forcing humanity into slavery. Out of the wasteland emerges Ryk, an escaped slave girl born with a unique power: merging her consciousness with the neural pathways of robots and healing them. Aided by a malfunctioning war machine, she embarks on a dangerous journey where she must overcome both her self-doubt and the mistrust of those she is trying to help. Only then can she accomplish a daring rescue and save a friend from a fate worse than death. 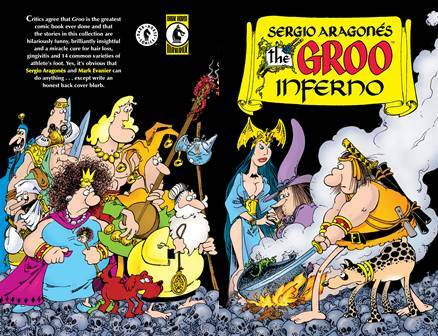 Groo the Barbarian has witnessed countless horrors, but can even he face the abomination that is ... his grandmother?! That's right! 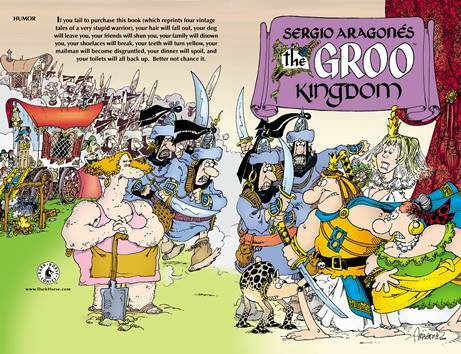 In this, the latest collection of stories from Groo's past, you will meet the matriarch of the Groo household. And if that weren't enough, then brace yourself for the wedding of Groo. It's sure to be the social event of the season! All the silliness you can stand brought to you by the Eisner Award-winning duo of Sergio Aragones and Mark Evanier. Groo has but one friend in the world - the loyal, royal pooch known as Rufferto. So what happens when Groo (stupidly, even for him) thinks he's eaten his one friend in the world? 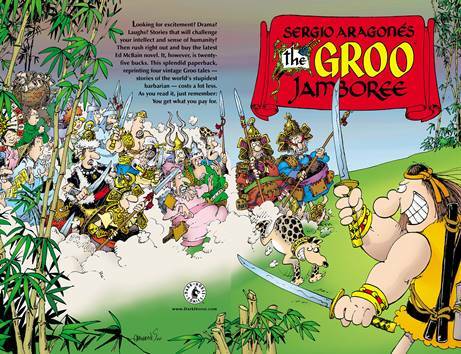 This two-part tale from Groo's past, plus two more equally silly tales by Eisner winners Sergio Aragones and Mark Evanier, comprise the Groo Jamboree! 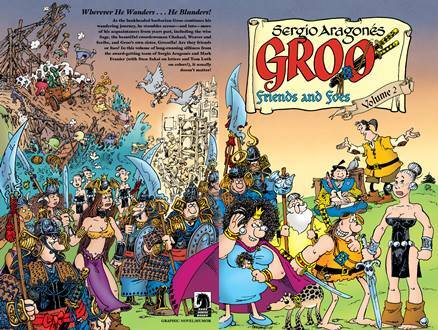 For some reason, people keep buying these Groo collections. So, in an effort to make a quick buck, Dark Horse is releasing The Groo Inferno, featuring four "classic" stories starring everyone's favorite moronic wanderer, Groo, and his slightly less stupid dog, Rufferto! See Groo recover a magical amulet for an evil wizard, only to end up unknowingly owning it himself--giving the world's dumbest barbarian the power to make anything happen, with the expected ridiculous consequences! 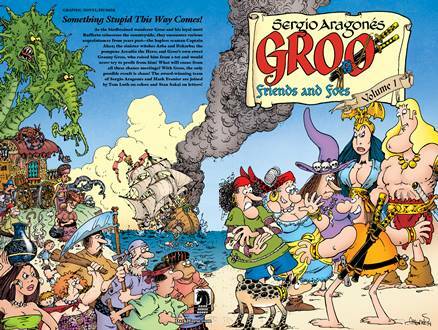 See Groo "defend" a village from pirates, in which confusion reigns and nothing is resolved! See ten bucks fly out of your wallet, never to be seen again!